This content was published: January 9, 2017. Phone numbers, email addresses, and other information may have changed. 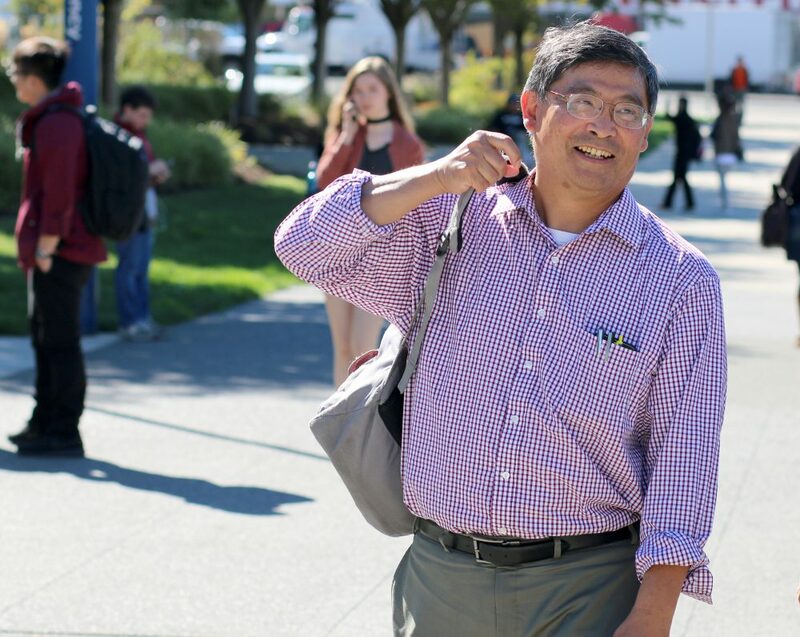 This fall, Mark Mitsui took time to meet with students, faculty and staff at every PCC campus. PCC’s new president has been going far with others his entire career. Along the way he has been a teacher, a senior administrator at Northwest community colleges, and a national leader in higher education, serving three years as deputy assistant secretary for community colleges in the Obama administration’s Department of Education. 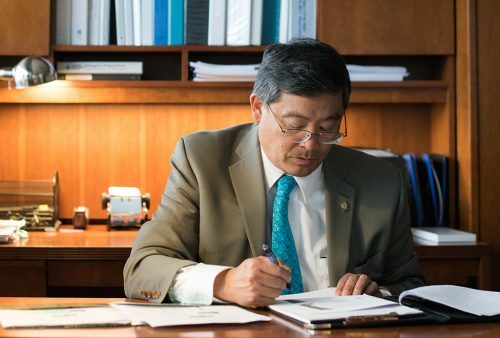 And though Mitsui accomplished much in this national role, his objective was always to return to a community college and apply everything he learned where it matters most. While president of North Seattle College he was lauded for many notable achievements, such as creating a strategic plan, navigating tough budget cuts and building successful student programs. But he may be best known for his sincere appreciation for students and colleagues alike, and for the culture of inclusion he helped nourish. Mark Mitsui’s outlook is deeply rooted in his family’s history. In the early part of the 20th century, his grandparents—both second sons unlikely to inherit family property—immigrated from Japan to Seattle seeking new opportunities. While president of North Seattle College he was lauded for many notable achievements. In America, his mother’s father became a farmer, and his father’s a railroad worker. But laws of the era made it illegal for these hardworking immigrants to become naturalized U.S. citizens. At a time when Irish immigrants could become Irish-Americans and vote for politicians to represent them, Asian-American immigrants on the West Coast were left out of the political process. “Asian American immigrants lost out on generations of political representation,” said Mitsui. When the Washington state legislature made it illegal for residents ineligible for citizenship to own land, his grandparents’ landholdings were wiped out. His mother’s family moved east and became sharecroppers in the Yakima Valley, living in sheds behind other people’s farmhouses. The family eventually bought land again, but experienced harassment from some in the community intent on driving out Japanese and Filipino farmers. “My grandparents and parents were viewed as the enemy—especially when World War II broke out,” Mitsui remembered. Alongside 120,000 others of Japanese ancestry, his relatives were forcibly removed to internment camps during wartime by the U.S. government—his mother’s family to Heart Mountain, Wyo., and his father’s to Tule Lake, Calif. Astonishingly, Mitsui’s own father volunteered for the U.S. Army during this period, serving in counterintelligence. After the war, he was able to attend college on the G.I. Bill, where he met Mitsui’s mother, an aspiring kindergarten teacher. Their experiences at college changed the trajectories of their lives and, ultimately, those of their children. “My family’s remarkable journey from Heart Mountain and Tule Lake to the University of Washington forever underscored for me the transformative power of both education and perseverance,” he said. Mark Mitsui was born on Beacon Hill in Seattle, Wash., in a mixed neighborhood with Chinese, Japanese, African-American, Native American and Italian families. 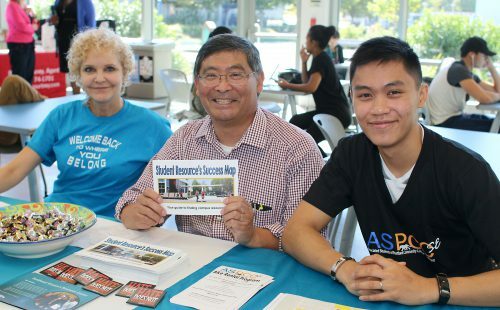 Mitsui is dedicated to fostering equitable student success at PCC. At the time, he did not realize that the ethnic diversity of his neighborhood was the result of racial intolerance. When his parents sought a larger home beyond Beacon Hill, realtors refused to show them property north of the Montlake Bridge. Years later, he would understand that many banks at the time did not make loans to people of color who wanted to buy in white neighborhoods, and that some home owners would only sell to white families. Undeterred, the family purchased a parcel of wooded land in unincorporated King County, where his father designed and built a house. The Mitsuis were the only family of color in the neighborhood. “My mother would introduce herself by saying, ‘Hello, my name is Tammie, and I am here to integrate the neighborhood,’” he remembered. Her charm offensive worked, and most neighbors welcomed the family. Mitsui played in the woods for hours with his new buddies, exploring streams, hiking and building forts. But while most were friendly, some classmates felt strongly he did not belong, and they bullied and harassed him. As a schoolboy, he was forced to stand up for himself many times—and such experiences became formative. The fact that students bring cultural assets and strengths with them to the classroom became an important theme for him during his career as a teacher, student services professional and administrator. Growing up, Mark Mitsui loved sports. They were a great social equalizer that also helped instill in him the values of teamwork, self discipline and accountability. In college he pursued kinesiology, the study of human movement, and began to appreciate at a deeper level the role of positive tension in the body and in life. Mitsui greets students at Rock Creek’s Multicultural Center. Since joining PCC in September, Mitsui has launched a listening tour, connecting with students, colleagues, partners and community members to gain a deep understanding of PCC’s strengths and culture. In the year ahead, he will focus on collaborating with these partners to see the college’s strategic plan come to life—with a special emphasis on equitable student success. For Mitsui, the college’s special responsibility to serve students of color and the underserved is derived from Oregon’s demographic and economic realities and opportunities. From 2000 to 2010, the region’s Latino population grew regionally by 97 percent, Asian population by 50 percent, and African American population by 34 percent. Meanwhile, since the end of the recession, there has been little to no income growth for households in the middle of the economic spectrum. The strongest growth has been at the very top and very bottom. Put another way, at a time when Portland remains the second-fastest growing regional economy in the nation— having created more jobs in the past 12 months than Houston, Milwaukee, Omaha and Albuquerque combined—income growth for the middle classes has stagnated. What will happen by 2020 when two thirds of all American jobs are projected to require some level of postsecondary education or training? Enter the community college. The new college leader has not been shy to show off his panther pride. This is a wonderful article. We are so fortunate to have a president with this level of commitment to our students and to the valuable mission of community colleges. We are so lucky to have a president as amazing and inspiring as Mark Mitsui. I’m very happy to go to PCC! Welcome president Mark Mitsui. Coming from the minority background myself, it is inspiring to read this article and makes my belief even stronger that i can do it! So proud be a part of this community. Thank You! I am proud to work for such an amazing organization, and I am so happy that Mitsui was selected as our president. He was my first choice! Thank you Mark Mitsui for bringing your inspirational attitude and knowledge to our campus! I look forward to meeting you!